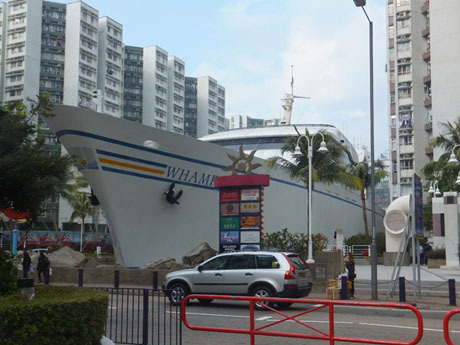 This is the “Whampoa”, a shopping and leisure centre disguised as a luxury cruise ship reconstructed in concrete. It has four decks with supermarket and restaurants and also houses a radio station. It is located on the site of the original No 1 dry dock of the old Hung Hom docks at Whampoa Garden. To get there take KMB bus 8A (circular route) from the Star Ferry Pier Bus Terminus, Tsim Sha Tsui to Whampoa Garden Bus Terminus. The bus operates at approx 10 minute intervals and the journey takes about 20 minutes. 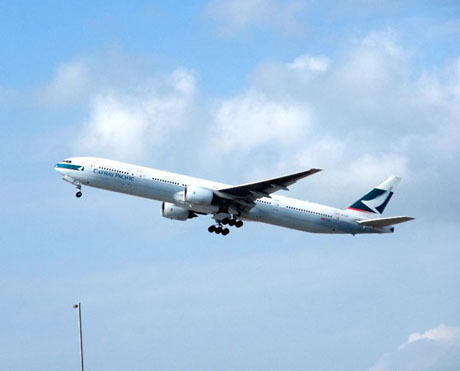 Plane spotters can enjoy great views of planes taking off or landing at Hong Kong International Airport from Sha Lo Wan Pier. 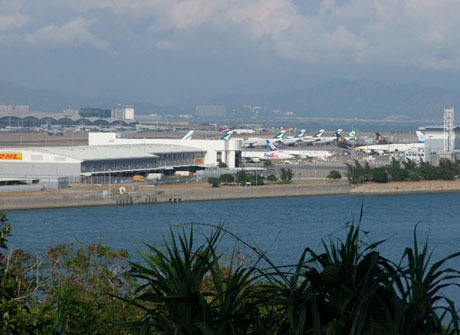 The pier is located right opposite the south runway just across the narrow channel between Chek Lap Kok and Lantau Island. The pier is served by the Tuen Mun – Tung Chung – Tai O ferry service operated by Fortune Ferry Company. Ferries leave daily from Tung Chung Development Pier and the journey to Sha Lo Wan takes only ten minutes. On Mondays to Fridays departures from Tung Chung are at 09-25, 11-25, and 17-25 with return ferries from Sha Lo Wan at 10-20, 14-20 and 18-20. On Saturdays there is an additional service departing Tung Chung at 15-25 and returning from Sha Lo Wan at 16-20. On Sundays and public holidays departures from Tung Chung are at 08-55, 10-55, 12-55, 15-25 and 17-25 and from Sha Lo Wan at 09-50, 11-50, 14-20, 16-20 and 18-20. There is a flat fare of HK$25 (HK$30 on Sundays and public holidays) regardless of whether travelling the whole route from Tuen Mun to Tai O or merely between intermediate piers. Payment can be made by Octopus Card or cash. Tung Chung Development Pier can be reached by following the path which runs between the Ngong Ping 360 cable car terminus and Tat Tung Road Garden to Tung Chung Waterfront Road. Cross Tat Chung Waterfront Road by the footbridge and follow the waterfront path north for about 300-metres to the pier. The walk takes about ten minutes from the cable car terminus. As an alternative to ferry it is possible to walk to the pier which is just off the main Tung Chung to Tai O coastal footpath from Tung Chung centre in about 90 minutes. Once past the large Yat Tung Estate on the outskirts of Tung Chung the path becomes very scenic passing through old villages, shrines, bamboo forest and under the Ngong Ping 360 cable car cables. Along the way, between San Tau and Sha Lo Wan is Hau Hok Wan View Platform and pavilion, opened in 2010, which gives excellent views over Chek Lap Kok and the airport cargo area. For enthusiastic hikers the full coastal walk from Tung Chung to Tai O takes about four hours. There are around 1,650 monkeys living wild in Hong Kong of which about 65% are rhesus macaques, 2% are longtail macaques and 33% are hybrids resulting from cross-breeding of the rhesus and longtail macaques. The monkeys are believed to be the descendents of pets released into the wild at about the time of the First World War and was related to the construction of Kowloon Reservoir, which was completed in 1913. The reservoir was the first to be built in the New Territories and before it was commissioned poisonous Strychnos plants were discovered around the reservoir. Although dangerous to humans and livestock, these plants are a favourite natural food for macaques and it was thought the monkeys would eat the plants before they dropped into the reservoir. The monkeys subsequently started breeding. 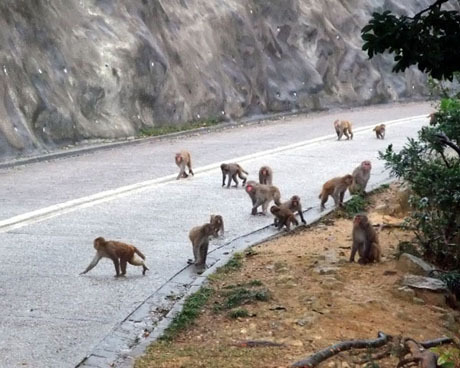 The easiest locations for visitors to locate these monkeys are the area on either side of Tai Po Road around Kowloon Reservoirs and Shek Lei Pui Reservoir in Kam Shan (known as "Monkey Mountain") Country Park and in Lion Rock Country Park. Walkers along the footpaths and trails in these areas will often find themselves accompanied by monkeys. Monkeys are also prevalent around Shing Mun Reservoir and there is a small Macaque World exhibition in the Shing Mun Country Park Visitor Centre at Pineapple Dam. Other areas where monkeys can be found include Tai Po Kau Nature Reserve, Sai Kung Country Park East and around the Ten Thousand Buddhas Monastery at Sha Tin. The monkey population rose from 1,400 in 2002 and reached to about 2,600 in 2007. However, a sterilisation programme under which over 2,500 monkeys were sterilised between 2007 and 2014 has seen the monkey population drop to its current level of about 1,650. The desexing programme, operated by the Ocean Park Conservation Foundation, sees the monkeys being lured into a large cage with food and then sedated and given a chemical vasectomy. Initially female monkey were given a contraceptive but, as this was effective for only three to five years this meant repeatedly rounding up and trapping the females. The monkeys are usually friendly enough to pose for photos but a ban on feeding wild monkeys without a permit was introduced in 1999 and a maximum fine of HK$10000 may be imposed on offenders. The ban only applies within Kam Shan and the surrounding country park area and between 2014 and 2016 there were 205 prosecutions for illegal feeding with the average fine being between HK$500 and HK$1000. Visitors should be aware that there have been isolated incidents of people being attacked by these monkeys, usually in an attempt to steal food. 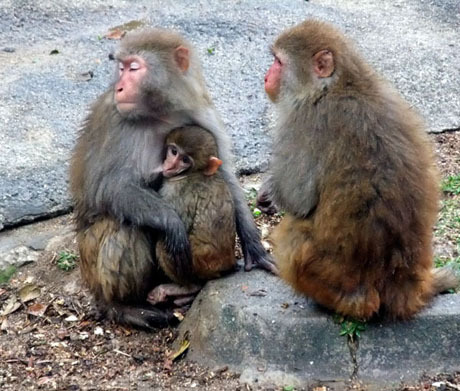 During 2016, 447 complaints of monkey nuisance were reported to the Agriculture, Fisheries and Conservation Department who manage the country parks and there have been increasing reports of monkeys straying into urban areas including Sha Tin, Mong Kok and Lam Tin although there were no reports of attacks between 2014 and 2016. Between 2001 and 2008 the government planted over 200,000 fruit trees across the country park to reduce the monkeys dependence on humans but the trees only bear fruit from May to October, leaving the monkeys dependent on other food sources for much of the year. Visitors can take KMB bus 81 from its terminus at To Wah Road, Jordan (near Kowloon Station) or "en route" on Jordan Road or Nathan Road where the bus stops near Yau Ma Tei, Mongkok and Prince Edward Stations. Disembark from the bus on Tai Po Road the bus stop "Shek Lei Pui Reservoir" (next bus stop names are displayed inside the bus). Alternatively, Shek Lei Pui Reservoir can be reached by taking either of KMB routes 81 or 72 from Sha Tin centre (either Sha Tin Town Hall or Royal Park Hotel bus stop). At Shek Lei Pui Reservoir the MacLehose Trail crosses Tai Po Road and is where Stage 5 of the trail meets Stage 6. Stage 5 leads into Lion Rock Country Park and Stage 6 leads to Shing Mun Reservoir. Walking along either stage of the trail for a short distance from Tai Po Road should lead to the presence of monkeys. The Shing Mun Country Park Visitor Centre at Pineapple Dam can be reached by following Stage 6 of the MacLehose Trail for about 5km or alternatively by green minibus 82 from Shui Wo Street, Tsuen Wan to its terminus at Shing Mun Reservoir. The green minibus operates until 23-30 daily at 8 to 20 minute frequency. The journey takes about 15 minutes. The visitor centre is only open on Saturdays, Sundays and public holidays from 09-30 to 16-30. The Lantau Link Visitors Centre, which is located off a busy highway intersection at Tsing Yi, has an outdoor viewing platform from where panoramic views of both the Tsing Ma Bridge and Ting Kau can be enjoyed. These bridges form part of the Lantau Link opened in 1997 to provide direct access to Hong Kong International Airport at Chek Lap Kok. 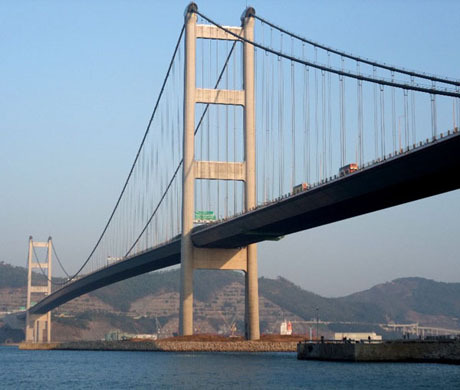 The Tsing Ma Bridge is 2160 metres long and when built was the longest single span bridge in the world. The top deck carries a dual three lane road whilst the lower deck carries rail traffic and has two sheltered single lane carriageways for use during high winds, emergencies and maintenance. The Ting Kau Bridge is 1177 metres long and spans the Rambler Channel connecting the west and north-west New Territories to the urban areas of Kowloon and Hong Kong Island. There is a garden area and indoor exhibition with models and technical information about construction of the bridges. The visitor centre also has a cafe and souvenir shop which is operated by New Life Psychiatric Rehabilitation Association which promotes local culture and tourism and offers work and training opportunities to psychiatrically disadvantaged people to assist in their social integration and self-reliance. OPENING TIMES - the Viewing Platform is open daily from 07-00 to midnight (to 01-00 on Saturdays). The Visitor Centre is open 10-00 to 17-00 (10-00 to 18-30 Saturday and Sunday) and is closed on Wednesdays. ADMISSION - free to both the visitor centre and viewing platform. GETTING THERE - Take MTR or Airport Express to Tsing Yi Station. Take Exit A1 from the station and then from the bus/minibus terminus take one of the following departures of Green Minibus number 308M to the visitor centre entrance. From Tsing Yi - Monday to Friday 10-00 and hourly on the hour until 16-00. Saturday, Sunday and Public Holidays 09-30 then hourly on the half-hour until 18-30. From the Visitor Centre to Tsing Yi - Monday to Friday 10-30 then hourly on the half-hour until 16-30. Saturday, Sunday and Public Holidays 10-00 then hourly on the hour until 19-00. The journey takes about 10 minutes. Alternatively a taxi from Tsing Yi costs about HK$50 for the outward journey and about HK$40 for the return journey. Excellent views of the bridge can also be obtained from Ma Wan at the opposite end of the bridge, particularly from Tung Wan Beach next to Noah's Ark. 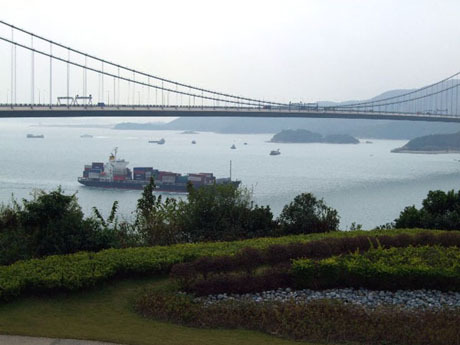 From Ma Wan Park there are also views of the Kap Shui Mun Bridge which also forms part of the Lantau Link. For details of how to get to Ma Wan see NOAH'S ARK. 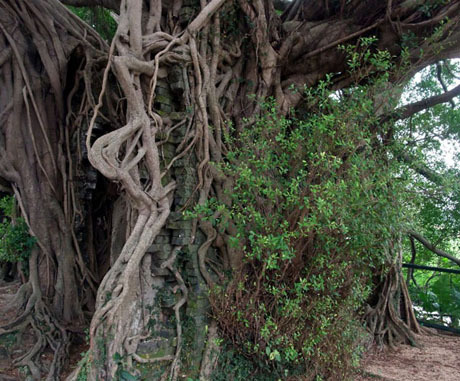 At Shui Mei Tsuen, Kam Tin is an old banyan tree whose aerial roots and trunk have completely enveloped a stone house with its roots sinking in to the brick walls and granite door frame. Some say the house was a Tin Hau Temple, others claim it was a study hall. The owner of the house is believed to have left during the Ch'ing Period following an imperial edict on coastal evacuation and never returned. The house fell into disrepair and as the tree grew bigger and bigger it wrapped itself around the house. 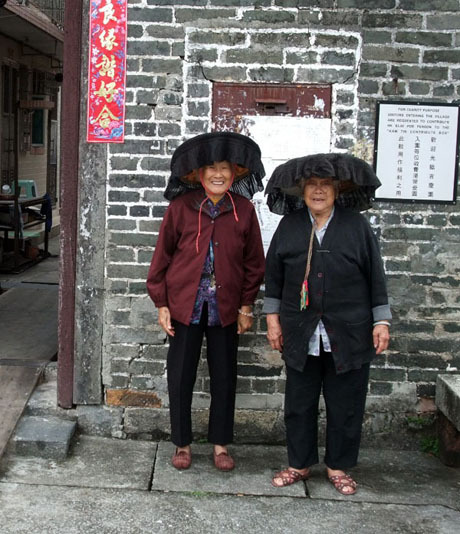 The tree is located on heritage trail with several historic buildings including temples, study halls and ancestral halls around walled village of Shui Tau Tsuen. Also nearby is Kat Hing Wai walled village. GETTING THERE - Kam Tin can be reached by taking KMB bus 51 from Tseung Wan West Railway Station Bus Terminus to the end of its route at Sheung Tseun Bus Terminus and changing to bus 54 or 251B towards Yuen Long or by KMB bus 64K from Yuen Long. Both Tsueng Wan West Station and Yuen Long Station are served by MTR West Rail Line. If taking bus 54 or 251B get off at the stop "Kat Hing Wai" or if taking bus 64K get off at "Mung Yeung School" (buses have display panels inside the bus indicating name of next stop). There are tourist signs to both Shui Tau Tsuen for the tree house (about 15 mins walk) and Kat Hing Wai.